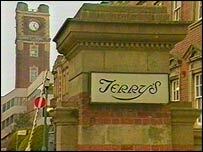 Workers at Terry's chocolate factory in York will lose their jobs in summer 2005, it has been confirmed. Kraft Foods, which owns the Terry's brand, announced it would be closing the site at Bishopthorpe Road, with the loss of 316 jobs. The GMB Union had hoped to move the production of Terry's Chocolate Orange and other products to a smaller site. But the company said it had "no alternative" but to leave the city and switch production to Europe. Plant director John Pollock said it had proved too difficult to produce an alternative plan to continue manufacturing in York that would be "sustainable, manageable or financially acceptable". "Our focus is now to move forward with our employees and to offer all the support we can between now and eventual closure in the second half of 2005. "We will also seek to work with York City Council and others to establish the most appropriate future for the site and to explore ways of preserving the heritage of Terry's and its connection with the city," he said. 1975 -Terry's of York acquired by United Biscuits. The council described the final announcement as a "huge disappointment for the city". Chief executive David Atkinson said: "We are determined to provide every possible support to the workforce and will aim to secure at least the same number of jobs from the site in the future." Unions are now negotiating a settlement with Kraft Foods on behalf of the employees. GMB spokesman John Kirk said people would now be given practical advice and support on preparing for future jobs. The York plant produces confectionery products for the domestic and international market including Terry's Chocolate Orange, Terry's All Gold and Twilight. The company's links with its home city were reflected in the Terry's of York name stamped on all products until four years ago. In 2000, its link with the city began to be phased out and since 2002 its products have been sold under the simplified name Terry's.